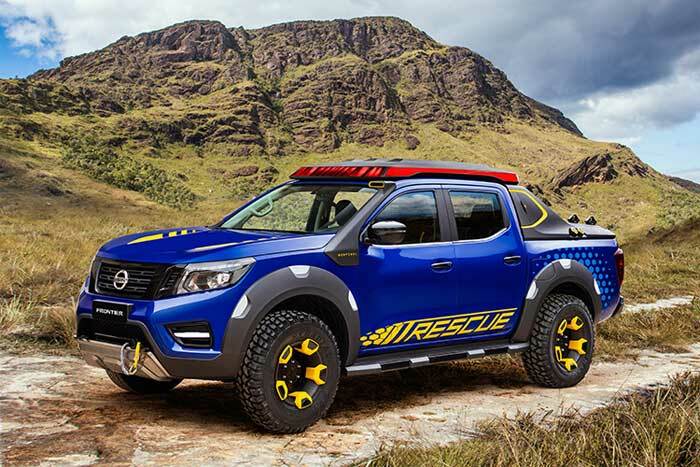 Nissan was on hand at the 2018 São Paulo Motor Show with a new concept truck called the Nissan Frontier Sentinel concept. The concept is designed to perform rescue missions on different types of terrain found in Brazil. Nissan gave the Sentinel two battery packs from the LEAF to provide for electricity needs. The bed of the truck is designed to accommodate the battery pack, and there is a set of drawers in the bed to hold gloves, flashlights, helmets, ropes, and other tools needed for rescue operations. On top of the bed is a platform that can be deployed to allow drones to take off and land. The roll bar over the top of the bed is strengthened to store equipment and has a pair of power outlets. The beautiful blue color of the truck is custom and was designed with inspiration from the Brazilian hyacinth macaw parrot native to South America; the color is called Thunder-blue. Other features include a snorkel, lighting system, and cool graphics, and wheels.